Dentist Health Advice: Is My Baby Teething Yet? You’ve changed and fed your baby. He’s had a nap, and there doesn’t seem to be any reason for his irritable behavior. Crying, fussy babies may leave you confused and frustrated, especially if you’re a new parent. 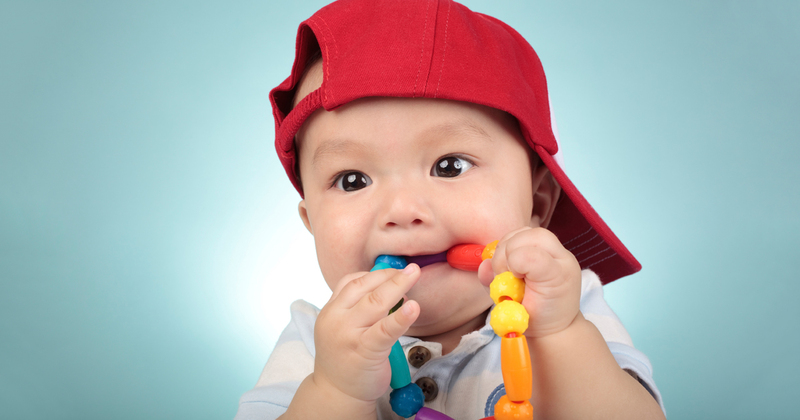 If there are no obvious health problems, your baby might be teething. Dentist health professionals say the following signs and symptoms suggest that tiny, new teeth will soon be making an appearance. Cranky Behavior If your normally happy, sweet baby suddenly transforms into Mr. Cranky Pants for no reason, a tooth could be pushing its way to the surface. Teething isn’t fun, so try to forgive his or her less-than-angelic behavior. Rubbing the Gums If your baby keeps rubbing objects against his or her gums, your pediatric dentist will tell you this is a clear sign of the gum irritation or itching that can signal teething has begun. Be sure unsafe objects are safely out of reach, especially when everything your baby touches seems to end up inside his or her mouth. Drooling (and Drooling…and Drooling) Excessive drooling is another common harbinger of teething. Some babies drool so profusely that a rash develops on their cheeks and chin. To keep your baby comfortable and dry, keep a dry cloth handy to wipe saliva from his or her face and change wet clothes often. If facial rashes are painful or persistent, ask for dentist health advice. Refusal to Eat or Fussy Eating If your baby refuses to eat or eats less than usual, this is also very likely a symptom of teething. Sore gums are often aggravated by sucking on a bottle. Continue attempting to feed your baby normally. If he or she persistently refuses to eat, consult your pediatrician or pediatric dentist for advice. Sleeping Difficulties Just as tooth pain can keep adults awake at night, the discomfort of teething can leave babies tossing and turning. Their sleeping patterns may change while they struggle with their emerging teeth, but things should go back to normal once your baby’s teeth break through. In the meantime, look for a good affordable dentist to take care of your baby’s new teeth when they arrive. Pediatric Dentistry Philadelphia Parents Trust When you have a baby, finding a good affordable dentist is essential. Research local dental health resources, read online reviews, and interview your friends, family, and neighbors to find the pediatric dentistry Philadelphia parents rely on for compassionate, skilled infant dental care. To get the dental care you deserve from an affordable dentist in Philadelphia, call today at or make an appointment. Dental Solutions Creating Smiles offers affordable family dentistry and gentle, compassionate dental care in Philadelphia. With 11 offices in the Greater Philadelphia and Southern New Jersey Region, our offices are conveniently located with extended hours to meet your needs. At , we provide most dental services, from basic preventative care and general dentistry to specialized procedures and complete dental reconstruction. We accept most dental insurance plans and offer affordable financial solutions for any budget. Patient satisfaction is our top priority and we strive to provide the exceptional, affordable dental care and personal touch that lead to lasting relationships. A smiling patient is our greatest reward and we look forward to keeping those smiles healthy, beautiful, and bright. Discover an affordable dentist who truly cares at .